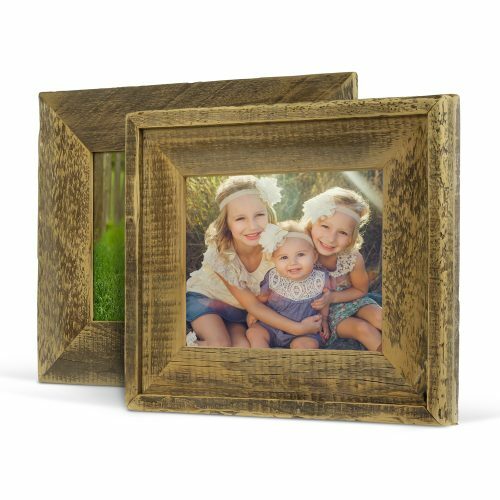 Add charm by displaying a special image in a genuine Barnwood Frame. From vintage themed weddings, to milestone moments, Barnwood Frames create a natural warmth in your home. Reveal your beautiful story with a frame that has a beautiful past. Handcrafted in Minnesota, these frames are built using reclaimed wood from old barns. Choose from two types of styles, standard Barnwood Frame or the Barnwood Frame with Trim, both with 4” mouldings. Barnwood Frames arrive fully assembled complete with craft paper backing, a wire hanger and a ‘Minnesota Made’ stamp on the back.